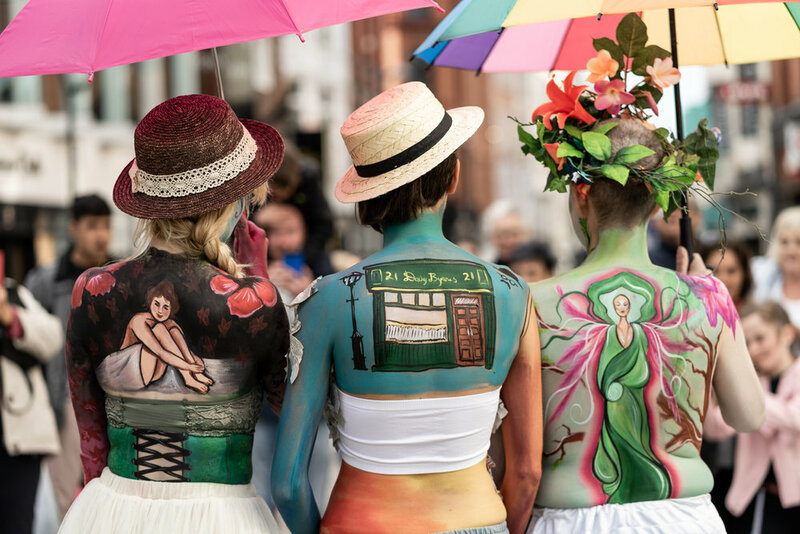 Join us this Bloomsday to body paint in celebration of the absurd and nutty in James Joyce’s masterpiece. During this very special jam we will give artists the theme of food and consumption. Joyce described Dublin’s fair city using vivid imagery of food stuffs. We’ll be helping artists along with the theme so don’t worry if you get a bit stuck! At our body painting jams, we will match up artists and models for a day of body painting. Photographers are invited to join us later to capture this transient art form on the day. Artists: Whether you fancy picking up a brush for the first time since the Junior Cert, or are a seasoned professional, you are welcome to join in. Artists will need your own body painting kit, but one can be rented from us for the day. Once painted we will parade through Dublin to bring our art to the city streets. Join us for the festivities and let your imagination run wild! Tickets: €30 (price includes lunch and materials).